Have fun! Pin It Now! A festive tale for you this month! Two weeks before Christmas last year, my son, who lives in Cape Town, called to say that he and his family were coming to stay with us for the festive season. As we had worked over Christmas running our Lodge for the past eight years, it would be the first Christmas I would ever spend with my four year old granddaughter. We had originally planned to go to the UK for the holidays, so had made no decorative preparations at all! A mad panic ensued in search of fairy lights and all things glittery for our little angel's first Christmas with Grandma and Grandpa Els. On previous year's when we ran the Lodge, we would buy presents for the children of the staff and the local settlement. These would be delivered by Father Christmas (aka Grandpa Els) and his two elves (my sister and I). Fortunately (or unfortunately depending on your perspective), we still had the Santa suit which could be dusted off for the occasion. Come a bright and sunny South African Christmas morning, and it is 85 degrees outside, but Grandpa Els still insisted on hiding in the office and donning his outfit complete with welly boots, full beard, Santa hat and a pillow up his jacket. He looked scarily realistic. To scarily it turns out - as he trekked up to the house ringing his bell, our little angel took one look and ran off screaming and crying. So much for good intentions. Poor little Chloe spent the rest of the day confiding in and preferring the company of our three dogs who were equally bemused by the stranger in the big beard. Linda x Pin It Now! If you would like to make this card which I have named Fantasy Forest this is how. 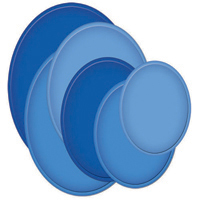 Cut out the three largest of the Decorative Ovals in white card stock. 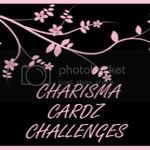 Cut out the largest Grand Ovals from white card stock and make a crease 1” from the top to attach to the front of the card. Cut 0.5 inches off the bottom to stabilise the oval so your card base won't fall over! 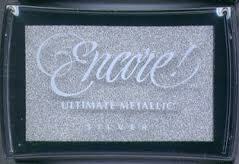 On your smallest Decorative Oval, stamp out the stag in Encore Metallic Silver, sprinkle with Stamp and Bond and heat. Then quickly pour over Fun Flock and leave to dry before you brush off the surplus. Do the same with the Joy & Peace sentiment from the Guardian Angel stamp set. If you don't have fun flock, glitter would work well too. Whilst you are waiting, ink up another piece of white card stock lightly with Encore Silver Metallic pour over the Stamp and Bond heat and cover with Fun Flock and leave to dry, it only takes a few minutes to be safe. 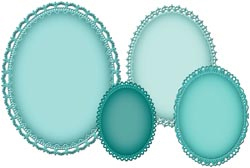 In the meantime layer up your Decorative Ovals with mounting foam to give your card dimension. Next thread through your ribbon through the holes around the edges of the largest oval. Mine is a soft velvet as the effect of the Fun Flock also gives a velvet look. 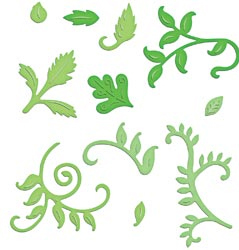 Now your original Fun Flock sheet should be dry and you can cut out as many of the Foliage 2 dies as you would like and lay them out. 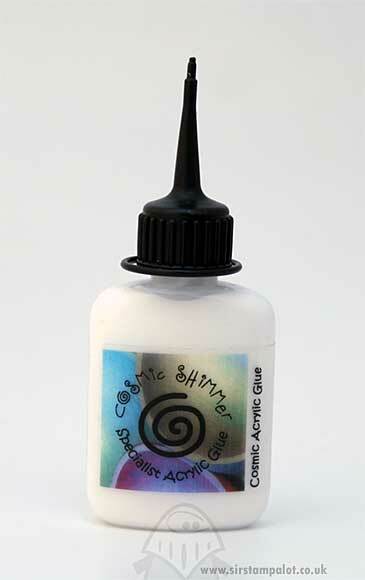 Once you’re happy with the lay out fix with Cosmic Shimmer Glue. 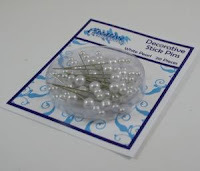 Mount up your sentiment with mounting tape and add a few pearl hat pins to give a pearly fragile feel. That’s it another Christmas card done and dusted!